ANY SIDE TRIPS EG. VICTORIA FALLS, HWANGE NATIONAL PARK ETC. WHEN A NATIONAL PARKS SCOUT IS REQUIRED BY CURRENT LAW FOR ELEPHANT, LION AND LEOPARD HUNTS . We require a deposit being 50% of Total Daily Rates plus 2% ZTA Government Levy be transferred to NYAMAZANA SAFARIS to secure a booking with the balance of Daily Rates to be transferred one month prior to hunt commencement. Hunts sold in the previous year will retain that years pricing on daily rates only. 1. There shall be no refund on any deposit paid if a hunt is cancelled within six (6) months of the date of commencement of the Safari. 2. In the event of a hunt being cancelled prior to six (6) months of the date of the Safari, then all efforts will be made to refund the full amount of part of the amount should the hunt be resold. Otherwise, if required the hunt will be sold at a discount against the deposit already paid. 3. In the event the Safari is cancelled by the Safari Operator, or the area is closed to hunting or travel for any reason, prior to commencement of the safari, the client will receive a full refund. 4. No refunds will be made if the client leaves the safari before the scheduled completion date. The balance of any charges i.e. trophy fees, rifle hire, curios, staff gratuities etc. must be paid prior to departure from camp, in cash.. NO personal cheques or Travellers cheques will be accepted in Zimbabwe by the Reserve Bank of Zimbabwe. 2% Zimbabwe Tourism Authority levy on daily rates. 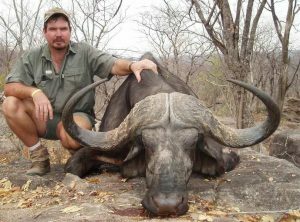 2% Zimbabwe Tourism Authority levy on trophy fees. 2% National Parks levy on trophy fees. USD $200 CITES tag each for Leopard/Elephant/Crocodile. USD $1 500 National Parks Hunting Permit Fee for Leopard with hounds per property as well as $80 per day National Parks scout who is present on actual hunt. Clients normally fly in and out of Bulawayo. Road transfers with the PH booked on the hunt, in the PH’s Cruiser are $250-00 should the camp be further than 400km. The PH vehicle can accommodate 1 person comfortably, and 2 people max. Should a road transfer in a larger vehicle or an air charter be preferred, we can arrange for this to be done. These are done based on the area that will offer the best possible opportunity to take the species requested, as well as numbers in the hunting party. They are worked on a first come first served basis. While we do try not to move bookings around once allocated to a specific camp, unfortunately there are times when this is necessary. Camps are normally booked exclusively. Hunt Contract – on acceptance of a quote and payment of the required deposit we will provide a hunt contract to be signed and returned. Indemnity Form – we require an Indemnity Form per person to be completed and returned prior to departure for Zimbabwe. This is a legal document so should be completed in full and legibly. Invitation Letter – will be provided as soon as complete client information is received with weapons and flight details included. It is essential for all clients to take out appropriate medical aid insurance that will also cover your repatriation to your home country. Global Rescue and Medjet Assist are good Insurances to look at.